Wolfmet 3D printed tungsten collimator proves to be the perfect answer as physics and manufacturing combine to progress molecular radiotherapy imaging. In molecular radiotherapy (MRT) of the thyroid, existing SPECT systems are unable to accurately quantify the radiation absorbed by those patients undergoing treatment. As a consequence, only limited information regarding the success of this radiotherapy treatment has been available – that is until now. Experts from the University of Liverpool – Department of Physics, and The Royal Marsden and Royal Liverpool University Hospitals have been working to develop an imaging system (known as DEPICT) that will better quantify the absorbed radiation and help facilitate personalised treatment planning. The ability to individualise treatments is expected to reduce costs by improving efficacy and patient throughput and simultaneously increase rates of successful cancer treatment, leading to improved quality of life and health for those patients. A critical part of the new imaging system is the CZT detector. This is used in conjunction with a parallel hole collimator with an active area comprising an array of 0.6mm Ø holes. Dismissing the use of lead for such an intricate design because of its unsuitable mechanical properties, the researchers decided that high density tungsten was the ideal material for the collimator. However, it would have taken many weeks and tens of thousands of pounds to produce the collimator with standard machining methods. The research team realised that they had to find a more innovative solution. That solution was Wolfmet 3D. 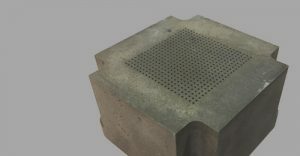 Wolfmet 3D is the revolutionary additive manufacturing process provided by M&I Materials. The process utilises a high powered laser to fuse successive layers of tungsten powder until a complex component is built. It is perfect for the manufacture of high-precision components such as collimators. Furthermore, collimators can be produced quickly and cost effectively (in days rather than weeks). The Wolfmet team worked alongside the researchers to establish the optimal design and initial tests have shown the system to be a success.With its excellent attenuation properties, a Wolfmet 3D tungsten collimator will significantly reduce septal penetration in comparison with the same collimator made from lead – resulting in much improved image quality. The team working on the project is hopeful that the DEPICT imaging system will be available commercially in the next 3 years.